Hi. Normally I write to your husband, with a “hello” for you and the elves thrown in, but this year I decided to write to you directly. You probably won’t remember me, but we met once before. It was during my 25th birthday at Disneyland. Because I have a late-year birthday, the park was decked out for the holidays. When I saw you in Santa Land, you wished me a Happy Birthday (I had on a birthday button) and I promptly burst into tears. I don’t really know why. Maybe it was because I’d never met you before. Maybe it was because I’ve known about you my whole life, but never known more about you than that you’re married to Santa. But regardless of the reason, you made me feel really special, even as a really big kid. How are you feeling this year? I’ve been thinking about you lots. It’s been a difficult time for women, and I imagine you might relate more than most. After all, not many women know what it’s like to be married to one of the most powerful men in the world, but you do. Have you ever had a dream for your life? Wanted a career? A Pole of your own to run? It’s hard to hold onto dreams like that right now, and that’s why I’m writing to you. I know you’ve got a lot to do, picking up after the reindeer and keeping Santa happy and healthy, but if you’re looking for something of your own, I’ve got an idea for you. Now, your husband has the gift thing down. (Please extend my thanks once again for the Fisher Price Kitchen when I was 3. It took me a long time to get the cooking thing going on my own, but that kitchen set got me started off well.) But, as you and I both know, there are more important things in life than those that can be built by elves. Right now, there’s a whole lotta fear, and not enough hope. A lot of people are feeling afraid and alone. Some of these people may even be on the naughty list. It’s not always their fault, Mrs. Claus. Not everyone is born with an equal chance in life, and sometimes that makes it harder for them to be “nice”. They deserve to feel like they belong, too. That’s where you come in. I know firsthand how skilled you are at making people feel special. I think we need a lot more of that right now. Maybe, if you told people how valuable they are, they might start to believe it. It might be the only kind word they hear in a year. It would be great if you could send people a letter, but maybe you can even just whisper it in their ear while they sleep. Remind them of the good in their hearts. Tell them about a time when they made someone else feel special. Let them know that they can do anything, that they’re important, and that they belong. 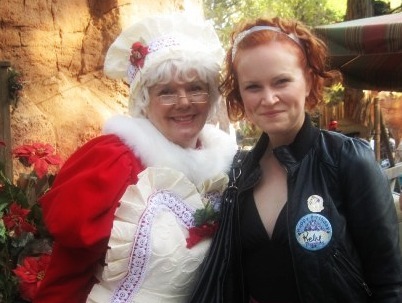 But most of all, Mrs. Claus, remind them that they’re loved. Love is what we need right now, more than anything wrapped under a tree. Not just for those who celebrate Christmas, but for everyone, regardless of race, (a)gender, religion, sexual orientation, or socioeconomic status. This is my wish this Christmas. Thanks for listening.